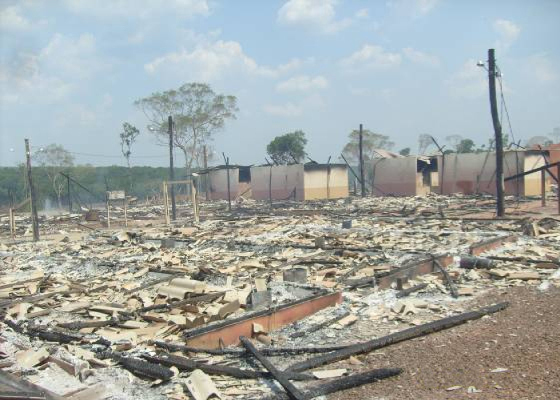 In an attempt to protect the Juruena river in western Brazil, an estimated 120 members of the Enawene Nawe tribe occupied the construction site of a hydroelectric dam on October 13, and then burned it to the ground. “They came armed with axes and pieces of wood, banished the employees and later set fire to everything” said Frederico Muller, a coordinator working at the site. At least 12 trucks were destroyed, along with a number of offices and housing units. All told, Muller suggests that there was at least a million dollars in damages. The Enawene Nawe see this is a major threat because the relatively isolated tribe depends on fish for survival. They are one a few tribes in the world that do not hunt or eat red meat. Fish also plays a crucial role in their customs and traditions… They say that if the fish get sick and die, then so will they. Before the Enawene took action, they had been taking part in a “consultation process” (information exchange) with authorities, where they learned the full extent of the development. It exceeded far beyond what they had been told up to now, prompting the Enawene to immediately walk away. Given the Enawene’s loud response, some form of reprisal can unfortunately be expected.